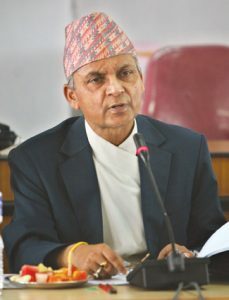 Khilaraj Regmi, former chief justice and former chairman of the interim cabinet, who successfully conducted the 2nd CA elections, said that as the constitution was promulgated against the aspirations and agendas of the People’s Movement 2 in 2006, the constitution is facing crisis in its implementation. The issues including Secularism were not the agendas of the 2006 April movement and they were addressed differently by the interim constitution and also by the new constitution, which has created crisis, he said. At an interaction program held on 22 June in Kathmandu jointly organized by Nepali Mukti Morcha and BP Chintan Prathistan, as new agendas [secular, federal republic] were introduced in the constitution, crisis has been witnessed in implementation of the constitution, he said. The tenure of the present parliament is till 21 January, 2018 and if all works mentioned in the constitution are accomplished by the given date, then only it can be said that the constitution has been implemented, Regmi said. He warned that if tried to extend the tenure of the present parliament that will be unfortunate. “By keeping one’s class or section, one cannot pave the way for peace and prosperity”, Regmi indicated towards the present intention of the major political parties for maintaining the politics of rejection. Bhagat singh Koshiyari, vice chair of the Indian ruling party, BJP, addressing the program advised that Nepal should preserve and respect her ancient culture and religion. Earlier, the political leaders used to blame the monarchy for destruction of the country, now, who to blame them, he questioned. “Nepal cannot be developed by constructing railway line by India and China”, he said. The Madhesh issue is not a big one compared to the question of safeguarding Nepal’s existence, Koshiyari remarked. NC leader Haribol Gajurel remarked that Nepal should remain as a Hindu nation to protect the Hindus all over the world. He said that the entire Nepali population is against the agenda of secularism which has been imposed in the constitution. Noted advocate Balkrishna Neupane pointed out weaknesses of the constitution and said that as this constitution cannot be implemented, this should be scrapped as soon as possible and revive the 1990 constitution. Previous Time to raise national flag!